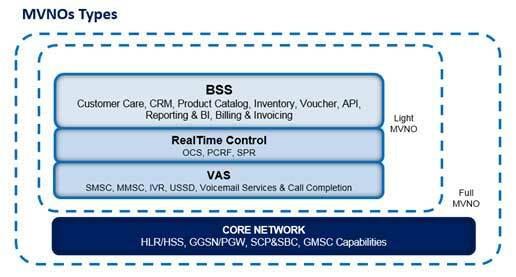 There are different models for Mobile Virtual Network Operators (MVNO). The models are defined based on the level of responsibility to operate certain parts of the stack that are attributed to MVNO, the types are: Reseller, Service Provider, light MVNO, full MVNO. There is also the “Enabler” model (MVNE) that provides the technology to the MVNO initiatives to implement their business models, and abstracts the complexity of deployment and operation. MVNE model arises from the need to facilitate entry to MVNO market by companies outside the telecommunications field, such as large Commercial chains, banks and companies of Entertainment; as well as telecom companies without radio spectrum in the market that want to incorporate mobile service in their commercial offer. 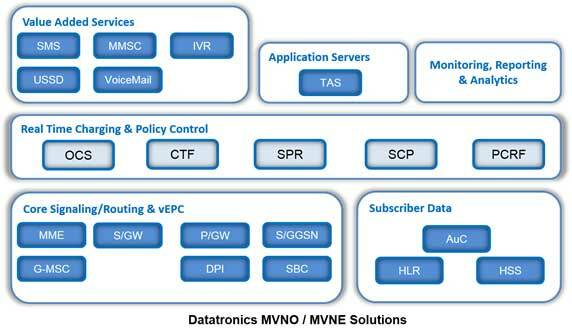 DATATRONICS offers to MVNO and MVNE a range of solutions that cover from basic interconnection needs to a complete solution with all the required elements for any Communication Service Provider can build its own network and becomes a full MVNO. DATATRONICS Solution enables a full 2G/3G/4G network core deployment. It is a best-of-bred solution with several manufacturers, each one of them focused on certain functionalities and elements of the network. DATATRONICS has worked to sure that each elements of the solution complies with 3GPP standards and also offers an open, scalable and flexible solution that is not linked to changes and evolution in the other elements of the network. DATATRONICS is a telco system integrator expert in operator networks and independent of vendors with multiple references in MNOs and MVNOs. DATATRONICS offers a modular solution that allows to have the elements that are really needed according to the service requirements. Also, it allows to use some elements that can be available and working in the MVNO. DATATRONICS solution permits and is open to add new functionalities, new standards and new elements that appear as a result of technological evolution of networks. As a multivendor solution, it allows to create new services quickly to follow the market trend where operators try not to have great dependence of a single manufacturer and vertical solutions. Each element of the architecture has been designed and optimized by each vendor for its particular functionality with criteria of reliability, scalability and efficiency. All the elements have been already tested, deployed and integrated in production networks. DATATRONICS offers flexible business models to be aligned with business models of its customers both technical and economical point of view.